I am spoiled. I live just 45 minutes far from Val d’Orcia. 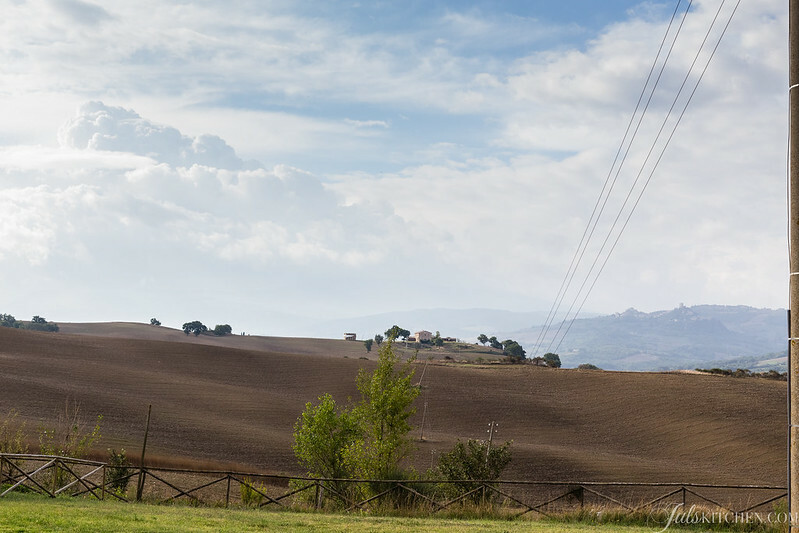 When you leave Siena driving south, the landscape slowly changes into soft hills, fascinating in every season, from the tender green of an early spring to the misty autumn brownish colours. 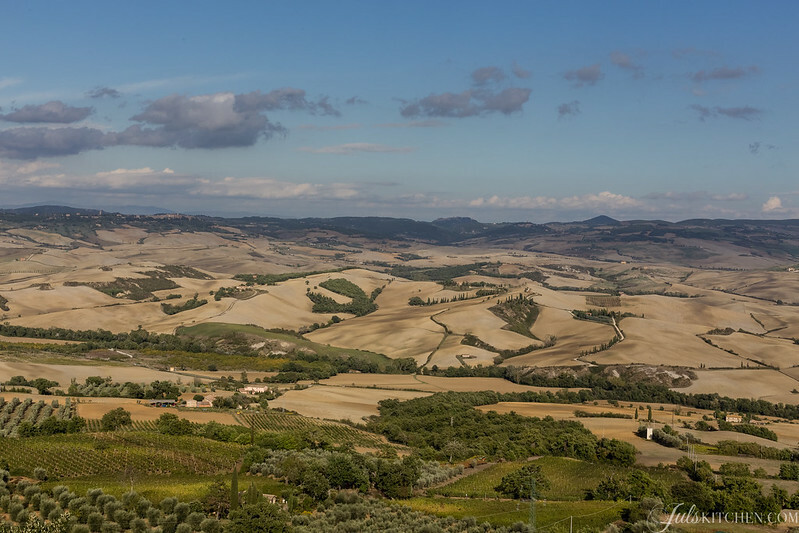 The Val d’Orcia landscape has been listed among the UNESCO World Heritage Sites. It is the valley of the river Orcia, redrawn and developed when it was integrated in the territory of the Siena city-state in the 14th and 15th centuries to reflect an idealized model of good governance and to create an aesthetically pleasing picture. It has inspired many artists and gentle hearts with its painting-like landscape, farmhouses, towns and villages, bridges, abbeys and the Roman Via Francigena. Nowadays it is famous for its cypress trees, for its typical pasta, pici, for its cheese, pecorino di Pienza, and for the wine, Brunello di Montalcino. 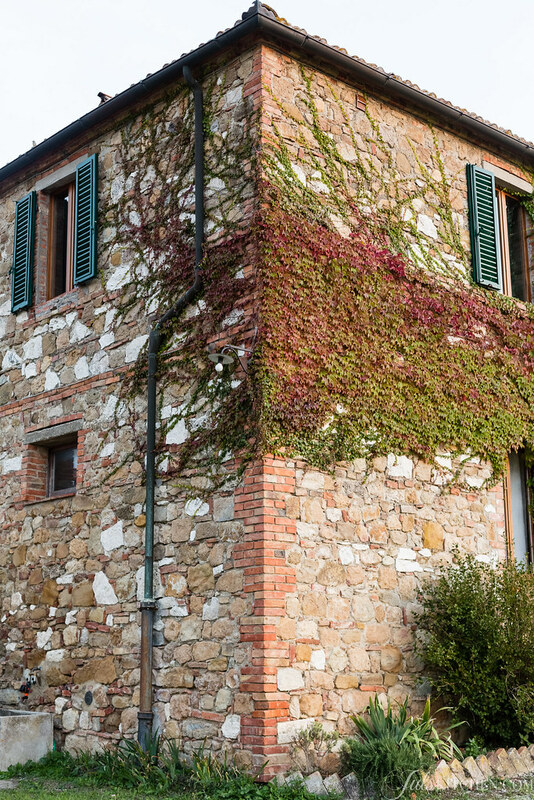 Can you imagine what a weekend in Val d’Orcia looks and tastes like? 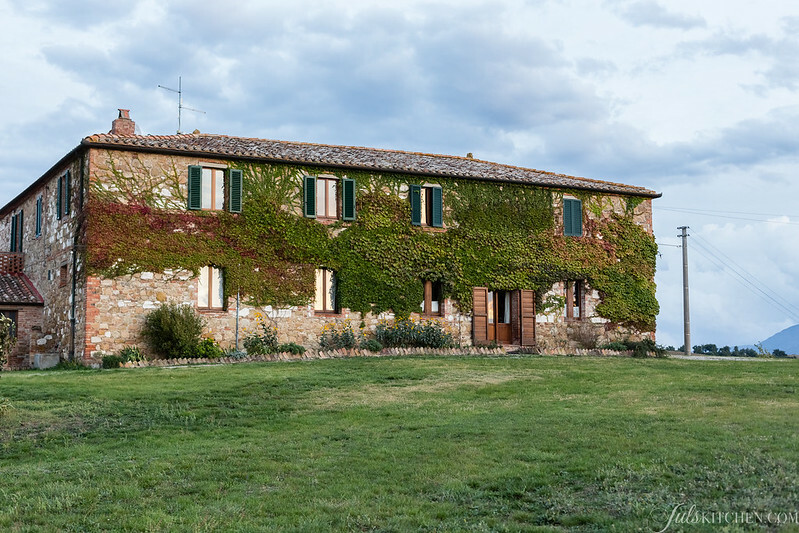 You would usually visit Val d’Orcia from April until October, as the weather is mild and usually better than in the rainy months from November till March. 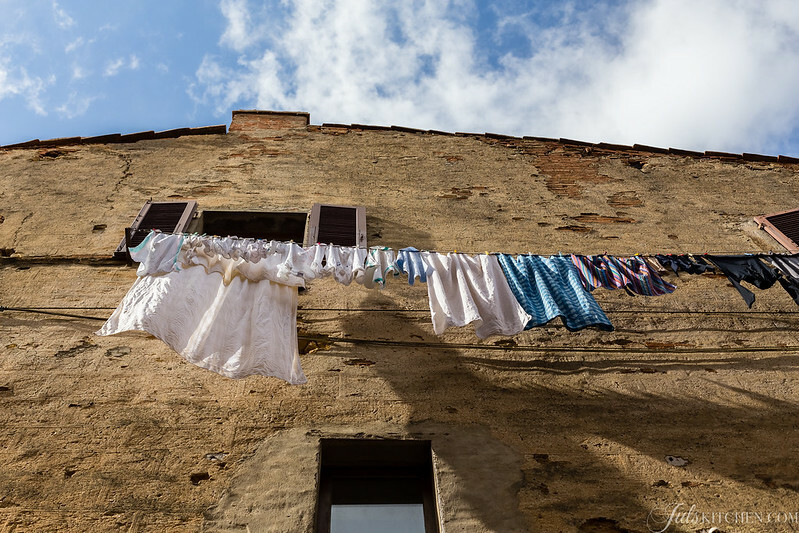 For this reason, you might have a hard time finding open activities – as restaurants, artisan shops and agriturismi – during winter months. 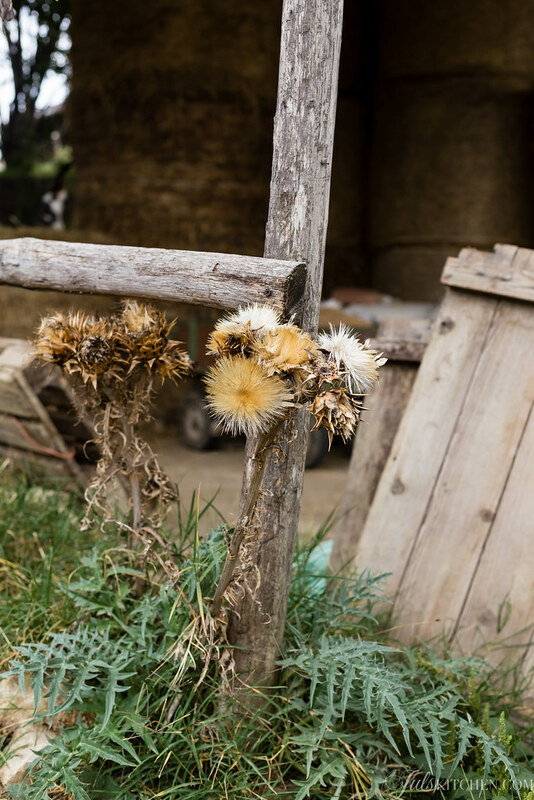 Though, if you are driven by a naturalistic interest and you want to wander in empty villages and in a charming wintry countryside, do not wait until the next season. 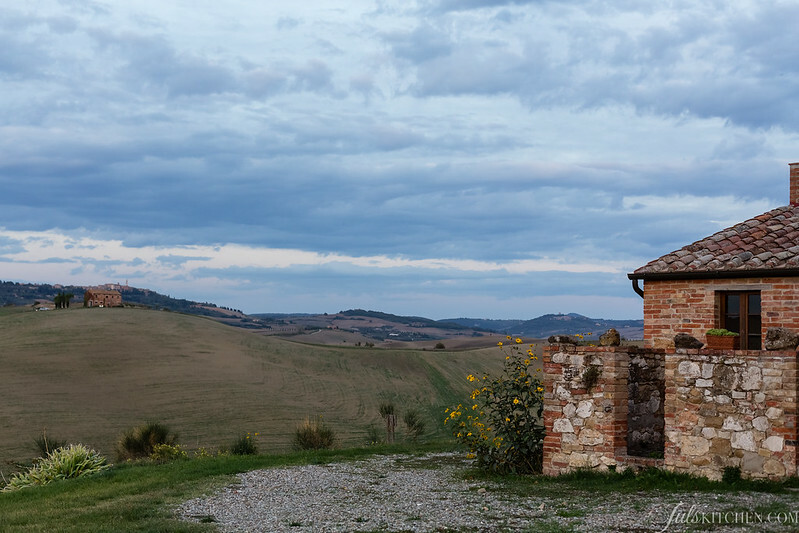 Val d’Orcia is an open-air treasure, which wants to be discovered. I have a soft spot for May and October, as I tend to avoid the hottest summer months, which is also when you would definitely find more tourists than local people in the narrow streets of the villages and along the panoramic roads. The choice is potentially endless. 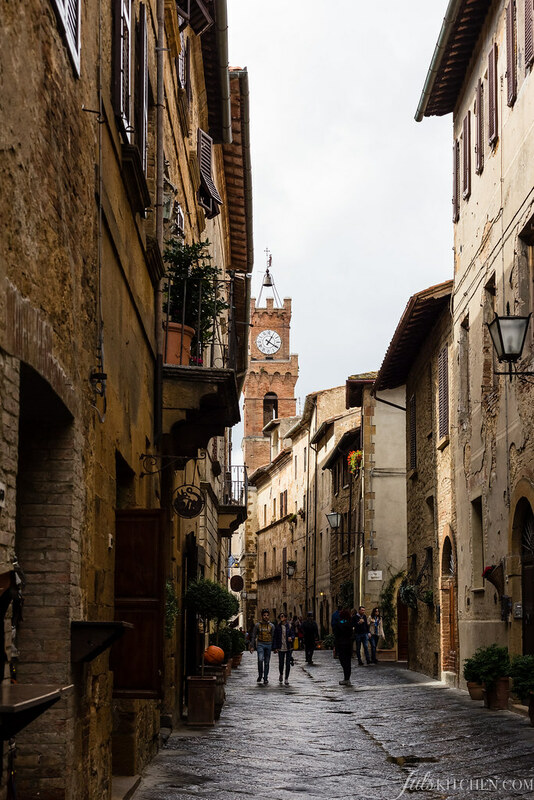 This time we visited Pienza, Vignoni, Bagno Vignoni and San Quirico d’Orcia, skipping equally fascinating towns like Montalcino, Rocca d’Orcia or other less known villages as Monticchiello and Radifofani. I do promise I will come back to write more, take more pictures, report more interesting foodie addresses and yes, have pici. It was a small forlorn village known as Corsignano until the 1462, when Enea Silvio Piccolomini, born there 53 years before, was elected Pope as Pio II. He asked a famous architect, Bernardo Rossellino, to redesign the village. 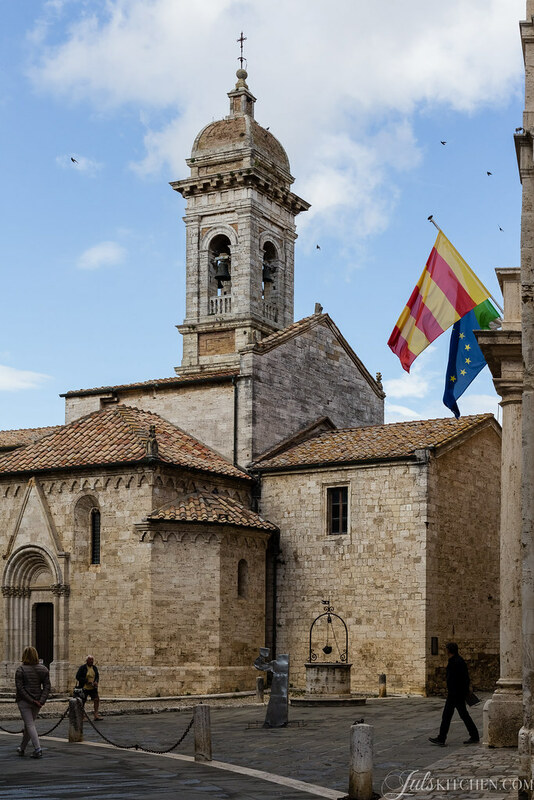 He built a new town, inspired by the Renaissance aesthetics, which was named Pienza after the Pope’s name. 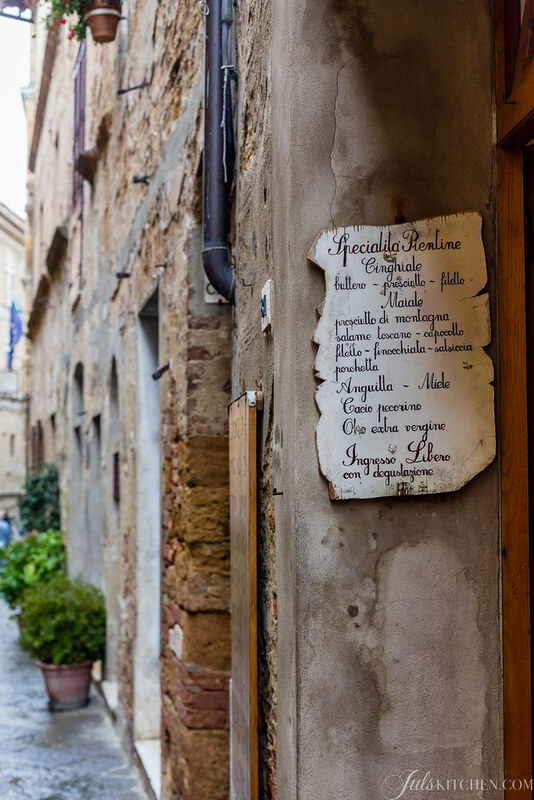 Pienza is still preserving its charming and romantic Renaissance look, a quiet village on top of a hill. 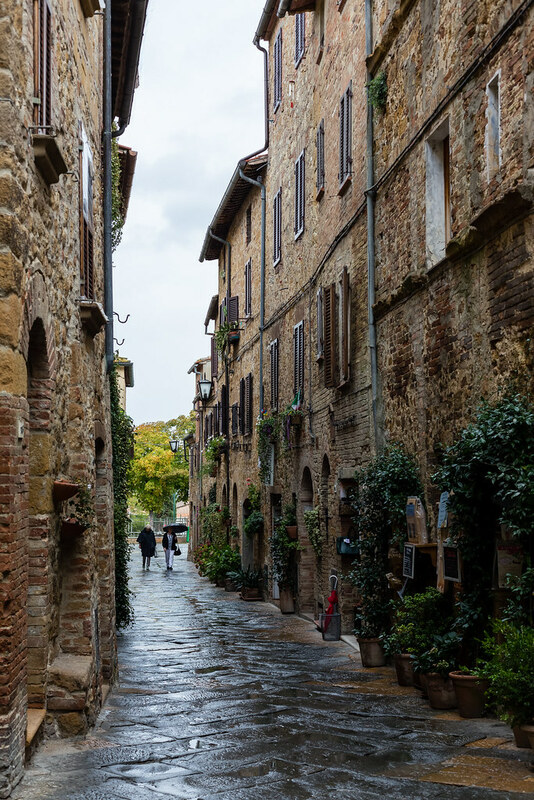 Park outside the town and walk in the narrow streets, search for the most romantic lanes as Via del bacio, Kiss street, Via dell’amore, Love street and Via della Fortuna, Fortune street, then reach the town walls and admire the Val d’Orcia opening up at your feet. Where to eat: La Bandita Townhouse café. 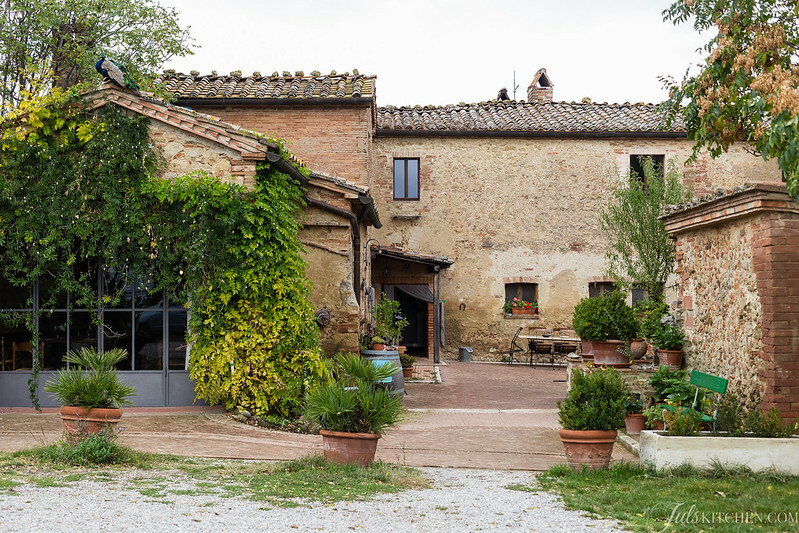 Stylish and modern, something you do not expect in Pienza, yet a cosy house restaurant and wine bar. 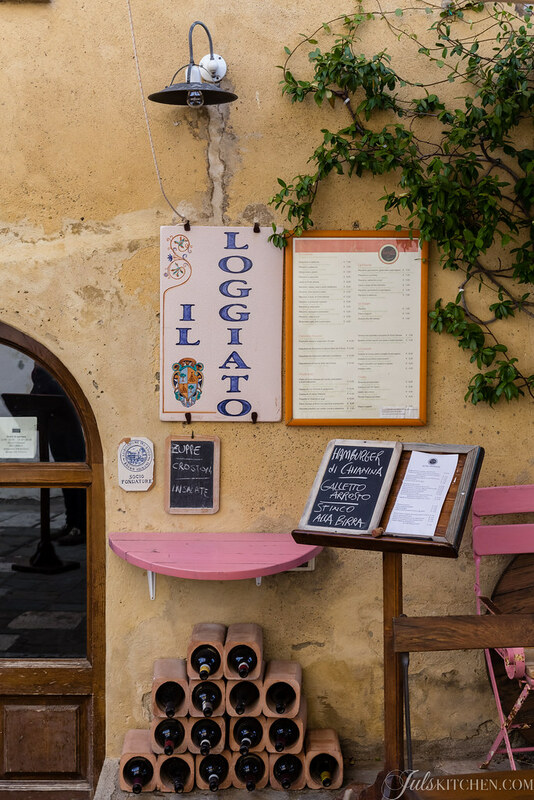 For a quick break visit the Osteria Sette di Vino, it has the menu in 15 languages and Luciano, the host, will be able to welcome you and make you feel at home. Where to have a sensational ice cream: BuonGusto, for seasonal and natural gelato. We tried strawberries and rosemary and later white coffee, made by infusing coffee beans in cream overnight. It could almost be a satisfying meal. Where to buy a good stock of pecorino: Il Cacio di Ernello for some original Pecorino di Pienza, a chalky sheep cheese which can be fresh, semi aged and aged. Try also the pecorino aged in walnut leaves. 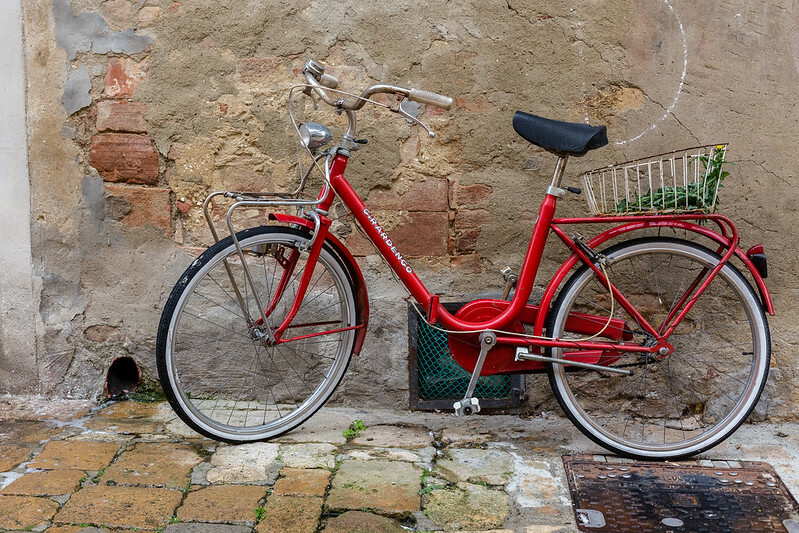 Where to do some local shopping: Ferro Battuto Biagiotti, for original wrought-iron objects, and Aracne, hand weaved scarves, stoles, accessories, tablecloths, runners, towels, plaids, curtains. Their threads and fabrics are all natural. 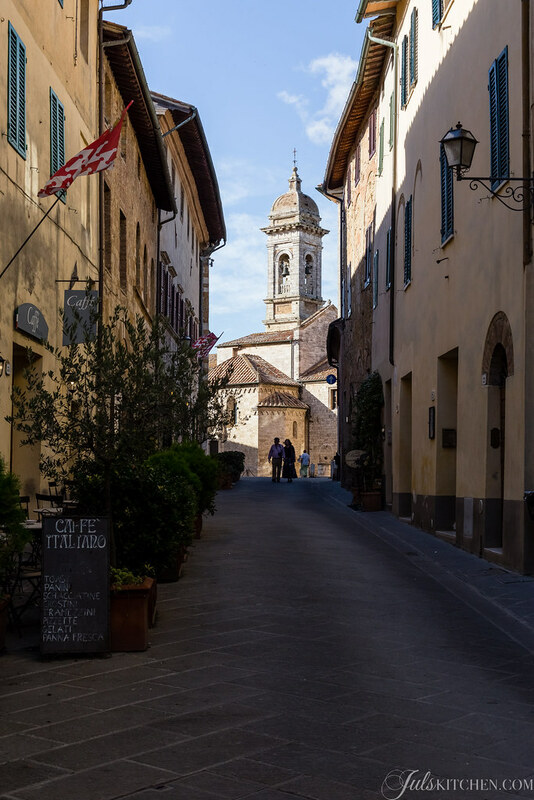 Less touristic than Pienza, yet still charming. Luisa from Agriturismo il Rigo was born and raised here in San Quirico d’Orcia and she surprised us with a unique lunch at her parents’ house. We were welcomed as part of the family and enjoyed a simple lunch where talks and laughs were the best seasoning. Visit the stunning Collegiata and the Horti Leonini, a public Italian garden, which usually hosts art exhibitions. You can visit it for free. Where to have a coffee with locals: Caffè Italiano. From the tables in front of the bar you have a wonderful view on the romanic arches of the Collegiata Church. I’ve been several times to Bagno Vignoni, a unique town with a thermal water swimming pool just in the centre of the town, an unusual square, what do you think? But this was my first time in Vignoni, the stronghold which faces the whole Valdorcia, now a tiny village with a few typical stone houses and one of the best views of the valley and of Rocca d’Orcia. 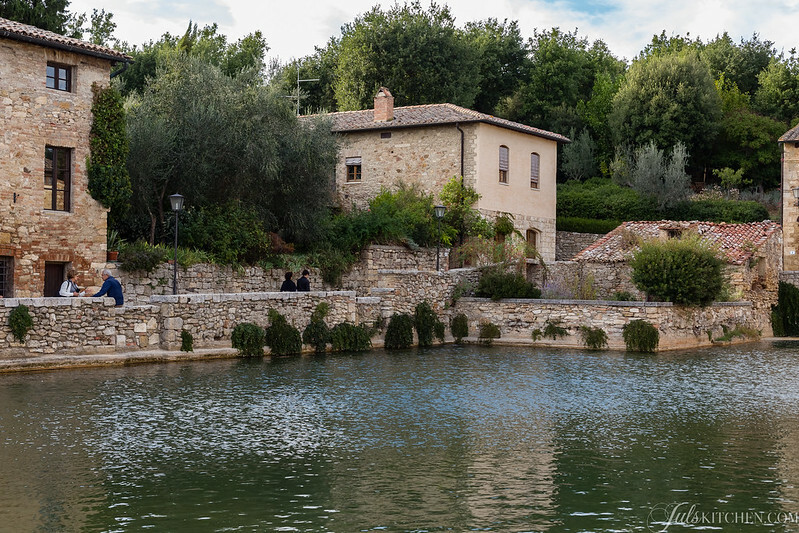 After a quick visit to the windy Vignoni, drive down to Bagno Vignoni. It is highly evocative in winter, when the warm water produces a magical mist, which wraps the whole town. Do not miss a stop at the thermal water streams, which run downhill. They are just outside the town centre. Find a comfortable spot, bring a towel and take off your shoes. Plunge your feet in the warm water and enjoy a steaming cup of mint infusion in the cold weather. Luisa and Martina treated us with this surprise, so appreciated after a whole day of walking! Where to eat: Il Loggiato. The menu changes every day, simple and hearty food. Where to do some local shopping: Hortus Mirabilis, a herbalist’s shop with spices, natural remedies, infusions and body lotions. I bought a mint and spices infusion which is warming my autumn afternoons. You feel at home at Il Rigo. 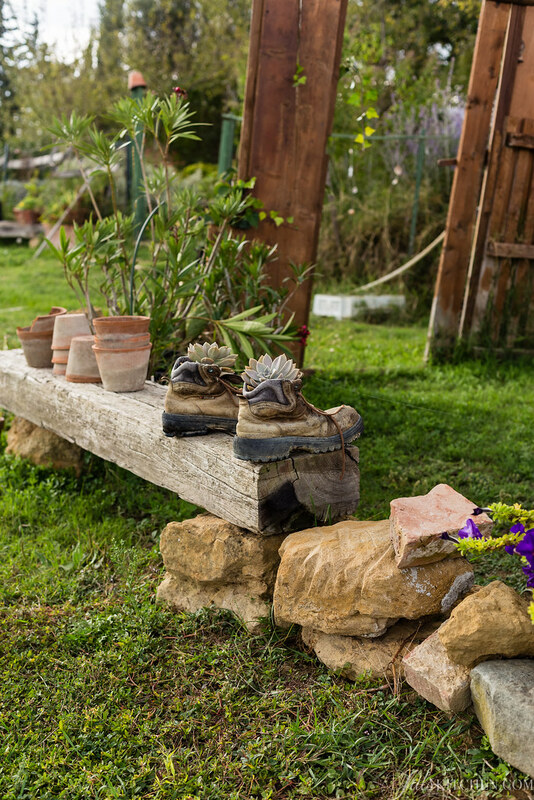 It might be the fact that it is a family run agriturismo, so you almost instantly feel like a part of it. It might be for the wild flowers arranged in every room, for the smiling welcome with which Luisa will greet you when you arrive. Let’s talk for a moment about breakfast. 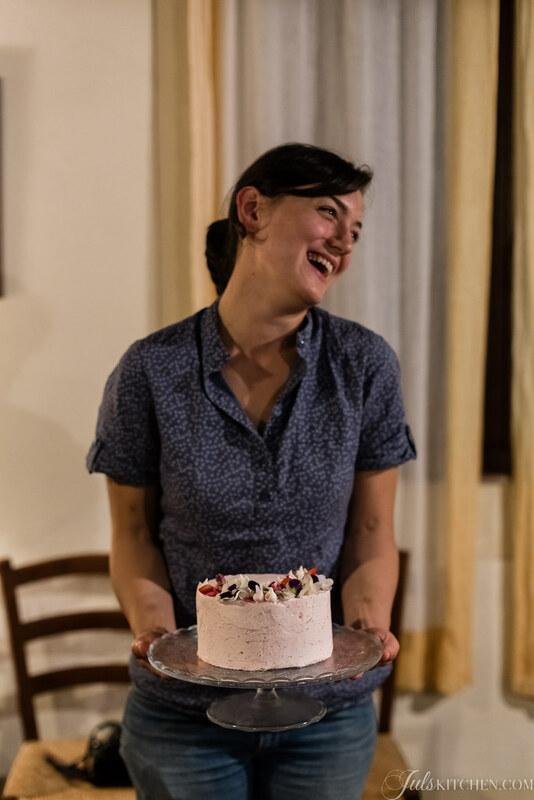 Luisa makes home-made cakes, cookies, biscotti, jam and marmalade. She even makes her own sourdough bread. You can have your tea, coffee or even a local apple juice. Pecorino, local ham and salami are there for your enjoyment. 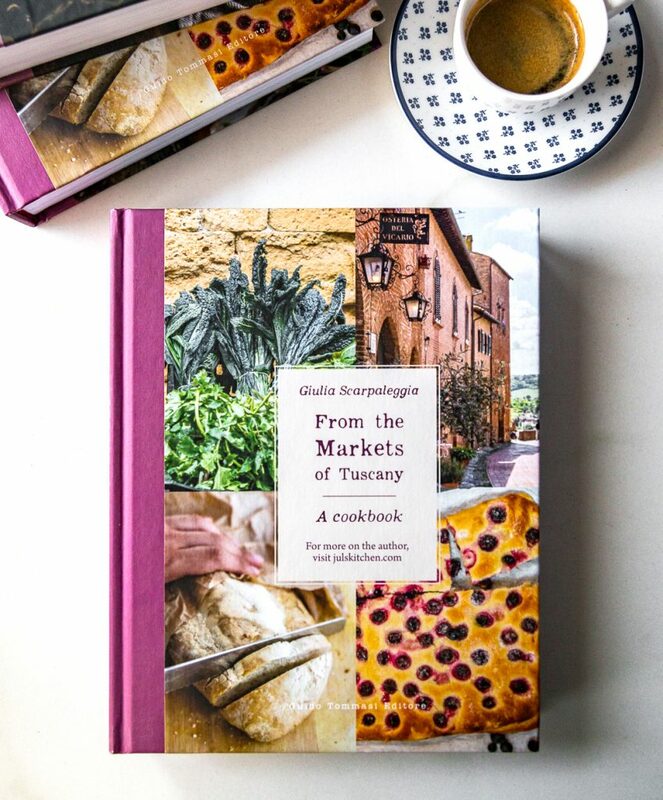 A few of my most loving readers have discovered my blog thanks to Luisa: I receive emails where they still dream of her hospitality, her home-made dinners, her warm welcome. 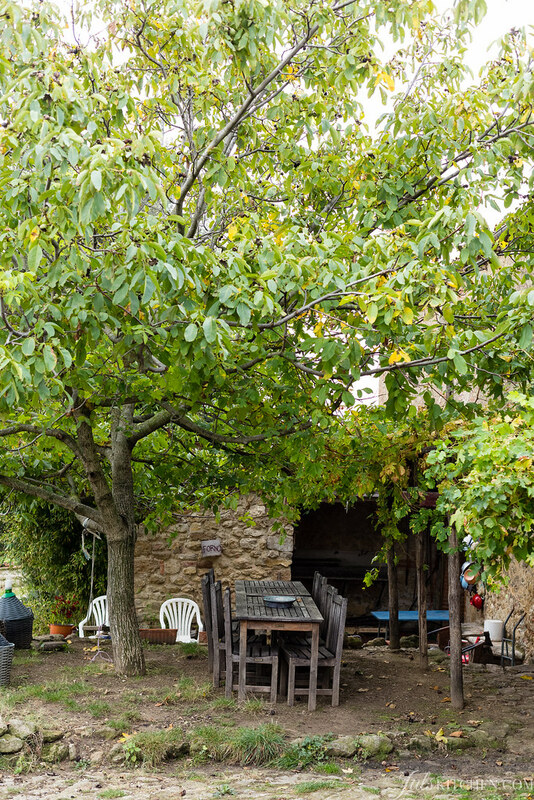 Il Rigo is a perfect spot to explore Val d’Orcia, but also to relax for a few days, moving from the sofa in front of the fireplace to the sun-beds outside. 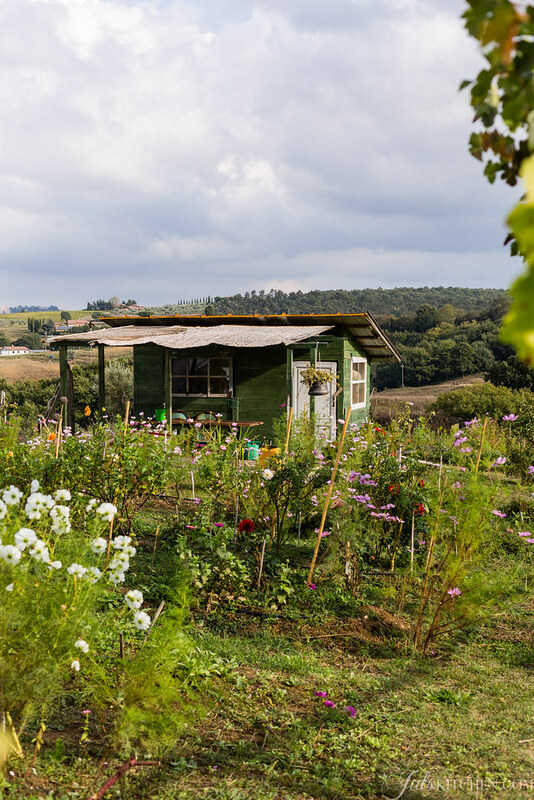 If you are more on the adventurous side, Podere il Casale is the place for you. They have guest rooms and a campground. This is what Ulisse says in his website: whether you come for relaxation, to work and learn, whether with or without children; you are always welcome. And actually you always feel welcomed. 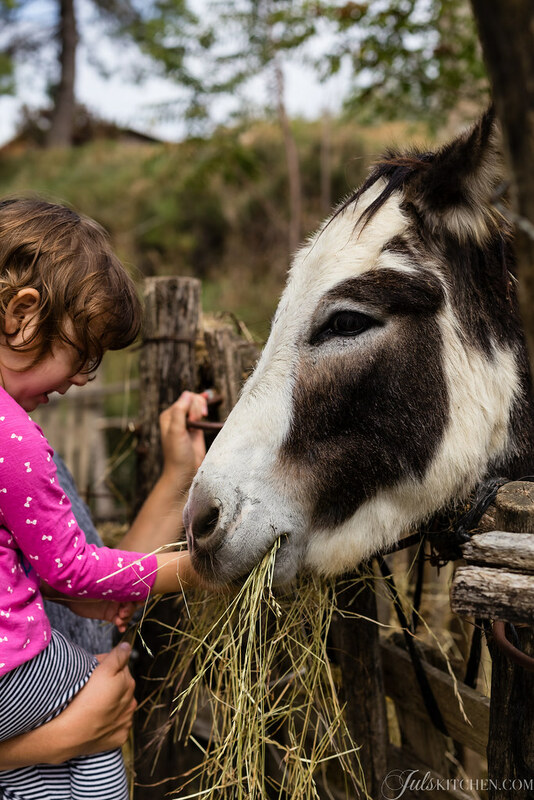 It is a place that children will love, full of animals and life: there are cats, dogs, donkeys, geese, chickens, sheep, goats and pigs. A special mention for the cheese, too. 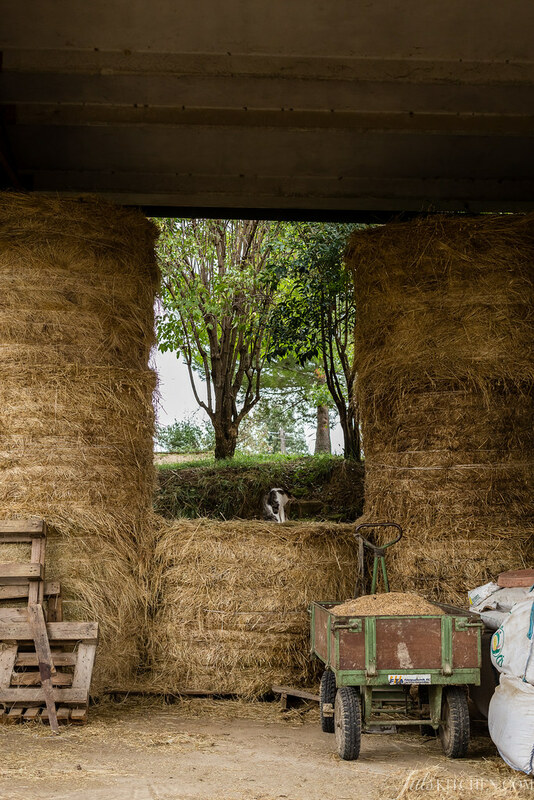 They make both pecorino – sheep milk cheese – and caprino – goat milk cheese. You can buy the cheese or enjoy it during lunch or dinner, along homemade dishes. Try their spelt salad, the best I have ever had. I will leave the chance to present the project behind Fiori di Puscina to the voice of the three sisters who had the idea to renovate the family business. 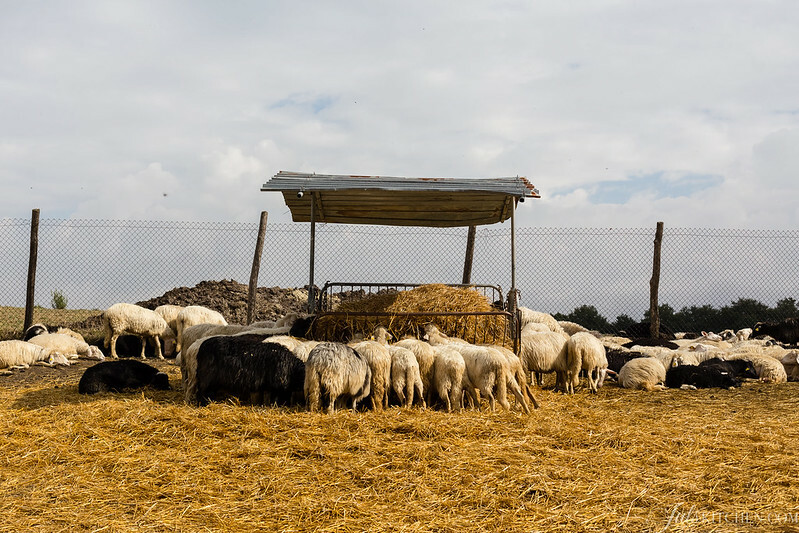 Until not so long time ago the whole agricultural production was used and meant to feed sheep herds, a few goats and pigs of the fine and renown wild breed ‘cinta senese’. The need for a renovation in the business and the challenge for the new generations to take over, lead us to conceive a new project. We felt very inspired by the nature and by the seasons following one another, we just needed some special ideas. The flowers gave us the right input: we began picking wild flowers around, just for fun, till we found ourselves throwing a handful of seeds to the wind… This was, briefly told, the story of the ‘renaissance’ of the Azienda agricola Puscina, a young company, a specialized lab for production of wild flowers and antique flower varieties. 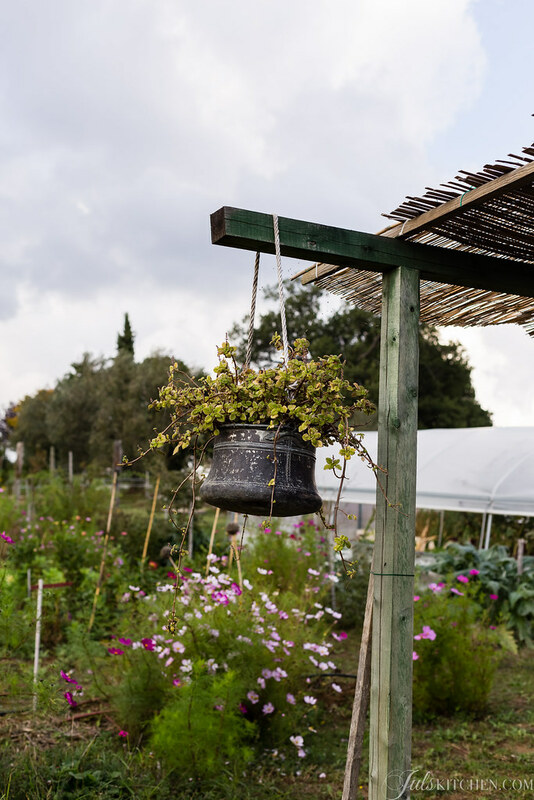 Seasonality, economy on local scale and tradition, this are the main themes of our work. 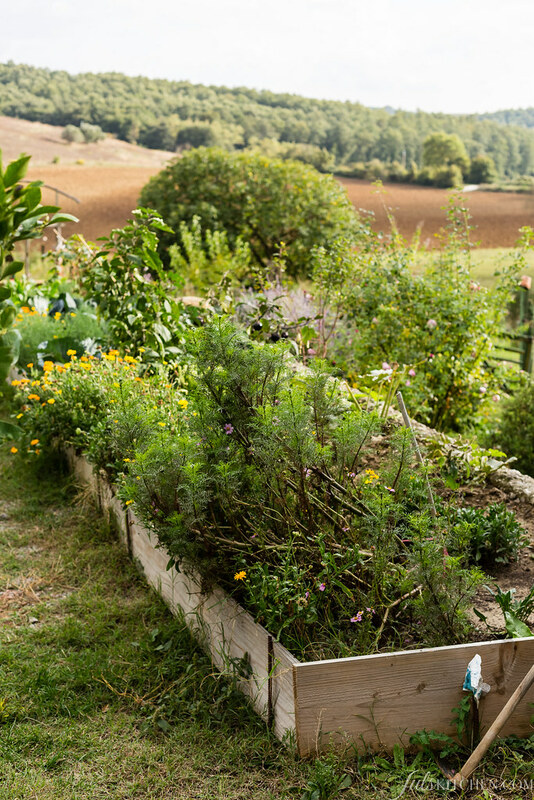 We believe in the importance of respecting our environment and looking for harmony with the nature, that’s why we go for sustainable practices in our cultures. It is impossible not to fall in love with their passion for beauty, a natural, sustainable, spontaneous and genuine form of beauty. Their enthusiasm is contagious, their flower creations are now present in local activities and are requested for weddings and celebrations. They also organize events, workshops and uniques experiences. 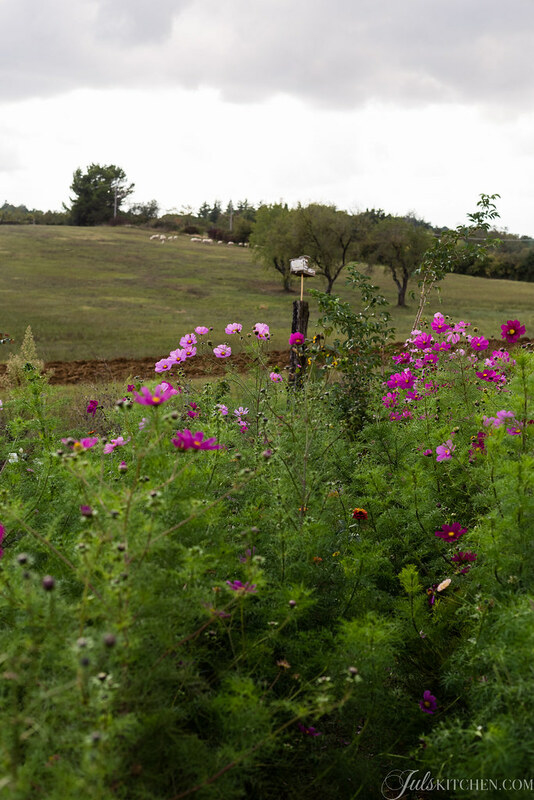 Stop by to visit the farm, you’ll be conquered by its wild beauty. Just one for today, but one which is the other perspective on this weekend. 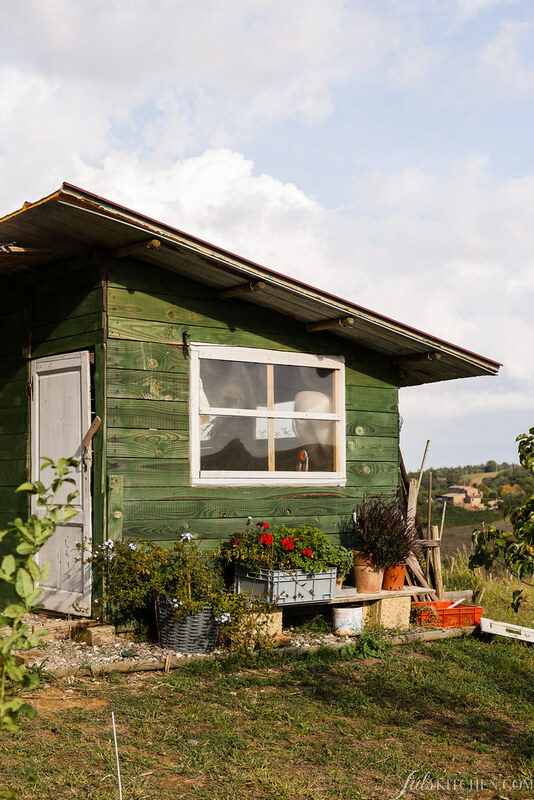 Emiko and I shared these two days, and this is her lovely post, Autumn in Val d’Orcia, an ode to Autumn and a travel guide to Val d’Orcia. Thank you so much Oleksandr, it is such a joy to discover that my recipes are inspiring your menu in Ukraine! As for the white coffee, you infuse the cream with coffee beans overnight, then you remove them the day after. The’ll leave their strong aroma, but no colour or other traces, magic! Beautiful, Gulia. I was in the Val D’Orcia exactly a year ago and stayed at Agriturismo Il Rigo. Many happy memories. Wish I was there now, but alas I am back in Australia. Thanks for the post. Thanks Giulia to share our project! we are so grateful & honored to met you and Emiko and for being a part of your story, inside an intimate and true point of view…Happy to know women with so genuine passion for simple and authentic things! wow, Very beautiful views. I hope can go there once time.